Our Sun rotates at a fairly sedate pace. While the Earth’s rotational period is about 24 hours, the Sun’s is about 25 days. You actually can’t give a precise period for the sun, because unlike the Earth the Sun doesn’t rotate all at the same rate. At the equator the Sun has a period of 25.4 days, but near the poles the rotational period is 34.4 days. This is due to the convective region of the Sun’s interior. While many stars rotate at a slow pace, some stars rotate very rapidly. One of these is the star Altair, the brightest star in the constellation Aquilla. 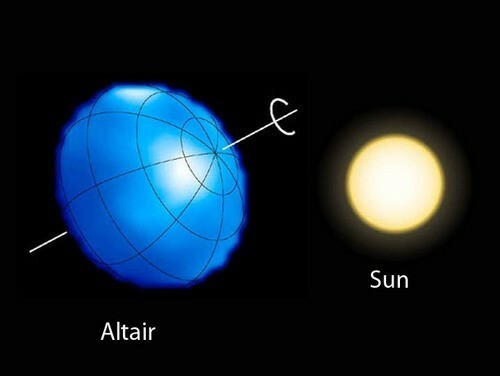 Altair was first imaged in 2007, and it was the first main sequence star (other than the Sun) to be imaged. Atair was imaged using array of six telescopes at Mt. Wilson observatory. Each of these telescopes is only about a meter (3 ft) wide, but they are spread over an area about 300 meters wide. When they are used in tandem through a process known as optical interferometry the light from these telescopes can be combined to create a “virtual” telescope 300 meters wide. This is important because the resolution of a telescope (level of detail it can see) depends in part on its size. The greater the size, the more resolution you can have. It isn’t feasible to create an optical telescope hundreds of meters wide, so optical interferometry helps us get around that limitation. While this technique has been used for decades, the signals from this telescope can be combined in real time (rather than separately and compared later). This means you can obtain even higher resolutions. High enough to resolve a star nearly 17 light years away as a disk rather than a point of light. The resulting image of Altair can be seen in the figure below. Although the image was obtained in the infrared, it has been given a blue coloring more closely resembling its appearance in visible light. One thing that is very clear is that Altair is not remotely spherical. Instead it is bulged into a spheroid. This is because Altair is spinning very quickly. Dopper measurements of light from Altair give its rotational speed at about 240 km/s, which gives it a rotational period of about 9 hours. This is a star larger than our Sun, and it rotates more than twice as fast as the Earth. The high rotation not only gives Altair a bulging shape, but it also causes its surface temperature to vary by latitude. Because of the bulge, the polar regions are squished together while the equatorial region is stretched out. This means the polar regions are more dense, and therefore hotter than the equatorial region, which is less dense and cooler. You can see this in the image of Altair, where the pole is whiter (hotter) while the equator is darker (cooler). The constellation Aquila is Latin for Eagle, and since Altair is the brightest star in Aquila, you could say we have now seen the eye of the eagle.